What should I make for the “Love At First Bite” blog hop, many sweet memories came to mind… french macarons, banoffee pie, date and banana shooters, panna cotta, chocolate eclairs, Pavlova… the sweet list goes on! But a firm favourite that stands the test taste of time, is crème brûlée. The words that come to mind when eating this dessert are… rich, smooth, silky, creamy… with a light caramelized crunch… a kind of culinary heaven! The literal translation of crème brûlée means “burnt cream” by which the sugar topping is quickly caramelized using the grill or a hand-held blow torch. My crème brûlée has a slight twist, I have replaced the traditional caramelized sugar topping with some home-made honeycomb. 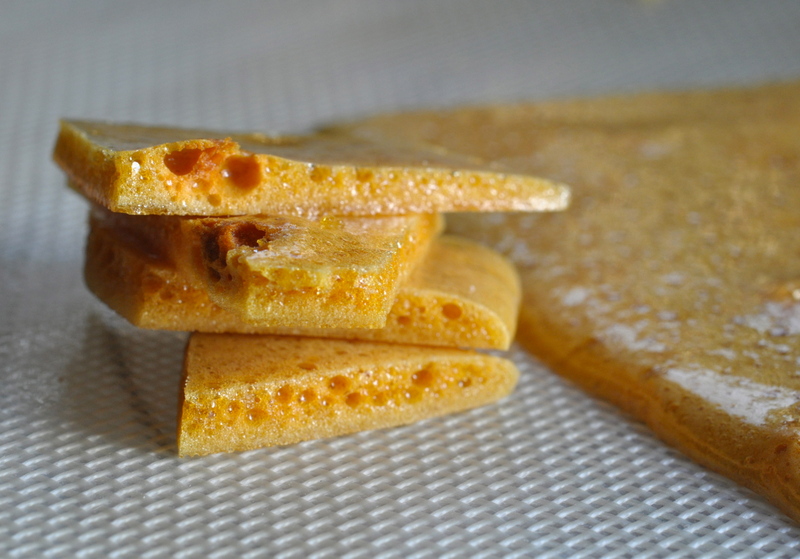 If you like Crunchie bars then this easy to make honeycomb is quite similar. In a heatproof bowl combine egg yolks and castor sugar, whisk vigorously until pale and slightly thickened. Pour the cream into a saucepan and gently heat until the sides of the cream start to bubble. Remove from heat and gradually pour the hot cream into the egg mixture while whisking. Place the mixture over simmering water, stir constantly with a spatula until the mixture thickens, this can take about 15 minutes. Pour into 6 or 8 (depending on size) small shot glasses and refrigerate until set which can take a couple of hours or leave overnight. Just before serving scatter over some lightly crushed honeycomb. If you are not using the honeycomb, dust over a light layer of icing sugar over the set custard and using a hand-held blow torch caramelize the sugar until browned. I would not recommend putting these shot glasses under the grill due to the intense heat unless you use appropriate heatproof dishes! In a small saucepan (with high sides) add the water, sugar and golden syrup and place over a low heat, stirring occasionally until the sugar dissolves. Increase the heat to medium and boil the syrup until it turns a more golden colour, this will take about 3 minutes, be careful that it does not burn. Turn off the heat and immediately add the bicarbonate of soda and mix it in quickly. It will foam like mad and start to bubble up the sides of the pan, quickly pour the bubbling honeycomb onto a slip mat or baking tray covered with baking parchment and allow it to flow level. Leave the honeycomb to cool and crisp up. Break into large pieces and store (separate with baking parchment) in an airtight container until needed. Can be made a day ahead. Honeycomb can be served alongside a shot of espresso, crush and folded into some home-made ice cream, scattered over mousse and cheesecakes or just enjoyed as it is! This post has been part of the “Love At First Bite” blog hop! Click on the badge and check out all the other entries! Both recipes look and sound delicious! What is castor sugar? I’m from the U.S., so when I first started looking at people’s food blogs, I had the same question as Casey (above). Your creme brule recipe looks delicious! My boyfriend has a torch in the garage and I certainly enjoy using it, so this recipe gives me an excellent excuse. I would love to crack into one of the shooters! Wow, you are my kind of cook. Love it! Glad I found your blog. I love the idea of the honeycomb topping!! What a great idea…delicious too. Crème brûlée and honeycomb shooters? I want a crème brûlée and honeycomb PINT! These look divine! 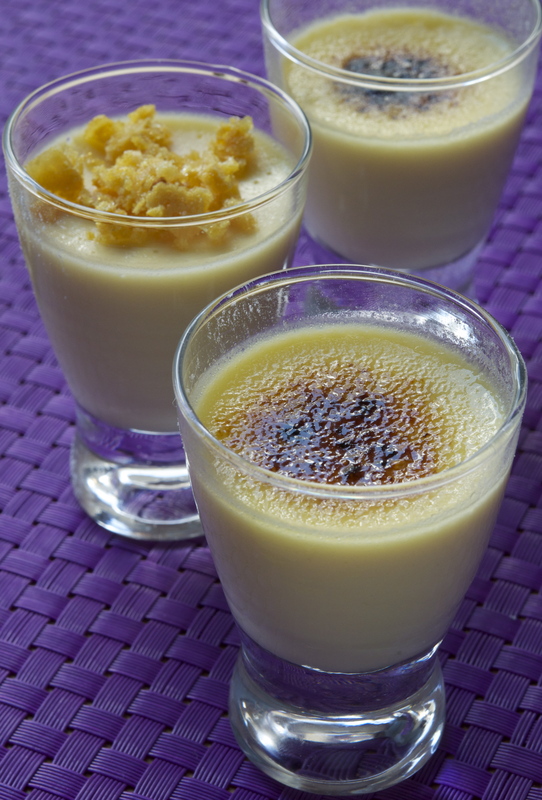 I could have a pint of crème brûlée as well, that is why I made them in shot glasses! 🙂 Thanks for stopping by. How fun! 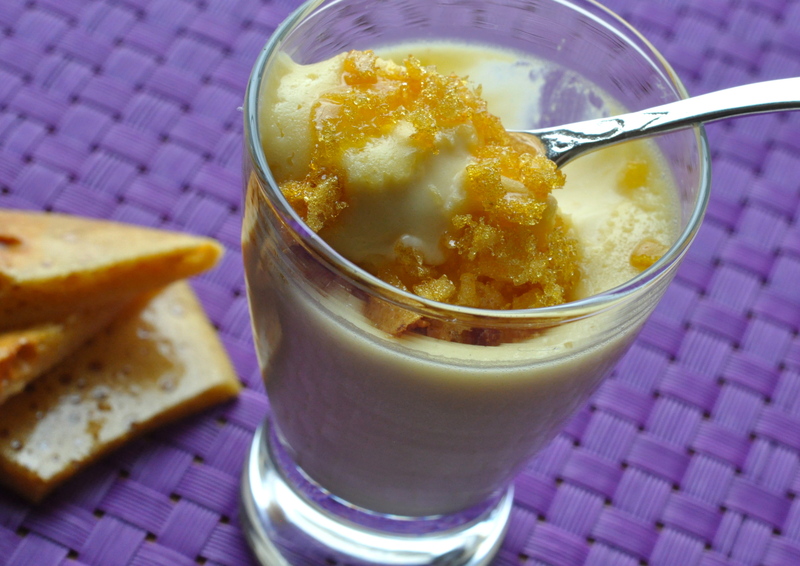 I love that you made mini crème brûlées – the honeycomb topping sounds delicious! You are marvelous!!! I love the idea of creme brulee shooters…and it would be hard to decide between the traditional or the honeycomb version…both so yummy! I love honeycomb but never really thought of making it myself! I’m definitely going to have to try this. My brain is working overtime now, what can I add honeycomb to?!?!?!! Brilliant, however there is no possible way I could stop at just one of those shooters! I’ve been wanting to make honeycomb for a while – thanks for the recipe! I also find it hard to have just one shooter… ! Let me know if you make the honeycomb.